are set to rock up in such shades as 'silver' and 'space grey'. 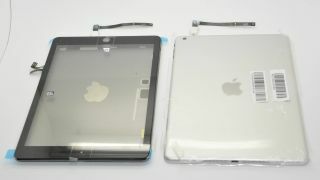 Serial leaker Sonny Dickson is back with some new shots of two new iPad casings, one in each shade of grey, and a handful of components to keep your rumour lust at bay. We've already seen the iPad mini 2's new grey togs. Apple seems to be bringing its iOS line-up in, er, line by ensuring that each device is available in the same shades. The silver also matches the MacBook range, so that's nice. Perhaps we'll even see the iPad mini 2 in a range of cheery colours like the iPhone 5C's afternoon salmon and offensively acidic green. We're hoping to see invites to Apple's iPad 5 and iPad mini launch event go out soon with the event itself taking place in October. Still, one question remains: how grey is space?